Between 2.3 and 5 percent of prisoners in the United States are estimated to be innocent according to the Innocence Project, a program that has successfully helped to exonerate over 350 wrongfully accused persons. 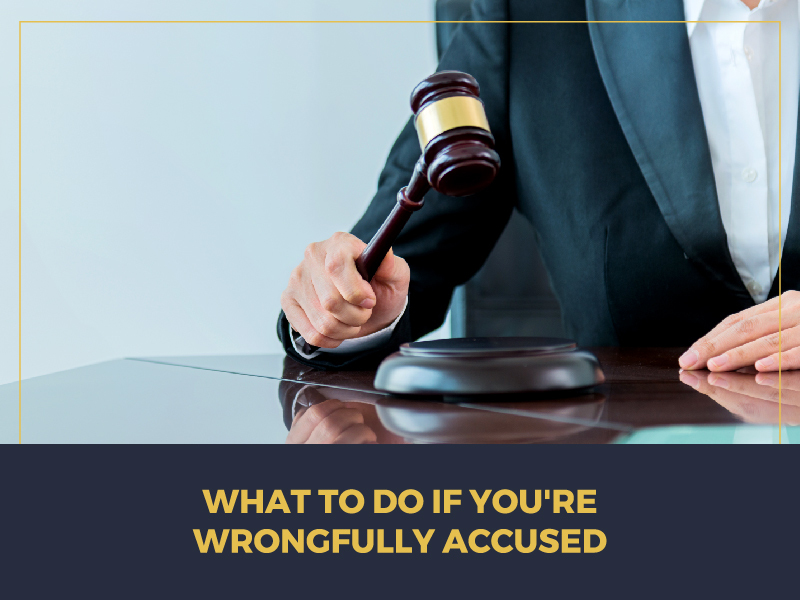 If you find yourself accused of a crime that you didn’t commit, there are several steps you can take to increase your chances of having the case overturned. When a police officer reads you your rights, he or she reminds you that you have the right to remain silent. Staying calm and keeping quiet can be difficult when being confronted by the police, especially if you’re being accused of a crime you didn’t commit. It is in your best interest to do so, though, in order to avoid unintentional incrimination or additional charges. Do your best to stay silent until you are able to contact an attorney. When you’re wrongfully accused of a crime, getting an attorney is of utmost importance. Find one as soon as you can, and preferably don’t talk about the case until you hear their advice. They will advise you on what you should do to avoid causing yourself more trouble.Finding an experienced criminal defense attorney will provide you with the best opportunity to clear your name. The innocent often need an attorney more than the guilty, so be sure to hire an attorney quickly. Gather any physical evidence that’s related to the case and present it to your attorney. This can include anything even slightly related to the event in question such as financial records or other similar documentation that would support the alibi of your whereabouts at the time of the event. Be sure to never destroy evidence that you feel could be incriminating in any way; destroying evidence can have serious repercussions. Reach out to any witnesses that can corroborate your side of the story. If you were present for the incident in question, contact anyone who was there who can give testimony to what actually happened. Be sure to record any witness’s contact information in as much detail as possible including names, phone numbers, addresses, and work contact information. Again, be sure to present all information to your attorney. If someone is willing to falsely accuse you of a crime, they are surely willing to twist anything else you or do against you. Avoid contact with them at all cost; contacting them can only create complications and damage. If your attorney feels it’s appropriate, he or she will send a cease and desist letter to your accusers requesting that they stop making false allegations. Proving innocence is not an easy task and becomes more difficult depending on the seriousness of the charges against you. Hiring an experienced attorney provides you with the best opportunity for exoneration, but the process will likely be long and expensive. If you feel that you have been wrongfully accused in Las Vegas, contact CEGA Criminal Law today at (702) 358-1138. Attorney Carl E.G. Arnold has the extensive knowledge and experience needed to best represent you and will work tirelessly to clear your name.